I recently wrote about The Tourists, and how I came to hear their music, which I enjoyed for two years until their untimely demise. Afterward, I had heard of Eurythmics forming from the ashes of The Tourists with Lennox + Stewart, so I kept a sharp eye out for the records. And waited. It wasn’t until after the earth-shaking success of the second “Sweet Dreams” album that importers were climbing over themselves to carry the band’s first album, “In The Garden,” Stateside. It was then that I finally heard what was the band’s second single, from 1981. “Belinda” is the band’s first classic single as it combines the group’s love of sixties pop with the darker themes they would explore for several albums. What makes this period so exciting are the deep ties to both classic Krautrock and Der Neu Deutsche Welle. Apart from Lennox + Stewart, the rest of the personnel who contributed to this single reads like a Who’s Who of German Post-Psychedelic Rock. They got Conny Plank to produce it. Robert Görl of D.A.F. is the drummer, and crucially, Holger Czukay of Can plays French horn. The A-side is absolutely glorious. Görl provides the motorik pulse of the song while Dave Stewart’s perfectly strummed guitars gently add their urgency to the overall propulsion inherent in the arrangement. Lennox’ vocal is so elegantly poised and that the tenderness of her delivery is unsurpassed. Her wordless vocals on the bridge are joined by Czukay on French horn for a single, sustained note at the chord sequences’s climax, but what a note it is! It sounds like the most perfect note in the world. It sounds like the sun rising. It sounds like hope itself, crystallized in sound. The B-side, “Heartbeat, Heartbeat” couldn’t be more different from the euphonious A-side. It features Czukay with Jackie Leibzeit, his cohort from Can, along with Marcus Stockhausen playing brass over the twitchy, ennervated music. Their stabs of brass sounding like nothing more than the same kind that punctuated fight scene in the Batman TV show of the sixties! Lennox vocals here are a dispassionate voiceover synching with the motorik rhythms of the song by repeating every utterance twice. Jürgen Zeltinger is credited with “heart attack” on the back of the sleeve. It’s that kind of song. Encountering this as a single took some years afterward. I bought this record mail order in the 90s and it probably cost at least $20 at the time, which was a great price for that time. It was the only way to hear the B-side until the 2005 Eurythmics remasters appended “Heartbeat, Heartbeat” as a bonus track on “In The Garden.” Even now, the single still goes for $20-$50 on average. It bears mentioning that the introverted sleeve illustration is from the hand of La Lennox herself. It was the only time she ever crossed the graphic arts line on one of her records. This entry was posted in Core Collection, Record Review, Scots Rock and tagged Annie Lennox, Conny Plank, D.A.F., Dave Stewart, Eurythmics, Krautrock. Bookmark the permalink. 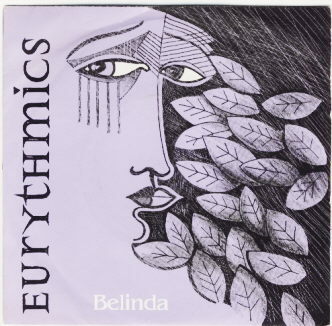 I’ve always loved “Belinda,” easily my favourite track on that original album. I remember this 45. Was there a sleeve-less 12″ too? ronkanefiles – No 12″ of any kind, according to what I’ve seen over the years, but I’d think that seems likely at the very least. Their 1st single, “Never Gonna Cry Again,” had a gatefold promo 12″ in addition to the standard sleeved 12″. I only had the 7″ [bought new a year after it was released] and have yet to see any data on if the 12″ differs in any except for size. Before I spend the [not insubstantial] bread for it I will be sure I’m getting some value in return.